Turmeric, or curcuma domestica, is an Ayurvedic herb that comes from South Asia. Turmeric is best known for being a key ingredient in curry powder, but it also has therapeutic uses. Many proponents of juicing, such as Cherie Calbom, author of "The Juice Lady's Guide to Juicing for Health," recommend turmeric both as a healing herb and as a way to add zest to your favorite juice recipe. Many natural health experts believe turmeric offers many health benefits. Turmeric might be beneficial in the treatment of atherosclerosis, liver problems, bursitis, headaches, flatulence and colic, according to Raymond Lombardi, author of "Aspirin Alternatives." In addition, turmeric might promote good digestion and regularity, as well as help detoxify the blood and liver. Turmeric is a natural anti-inflammatory agent, and it might help relieve inflammation associated with rheumatoid arthritis. Turmeric might also help relieve the symptoms of multiple sclerosis. You can reap the benefits of turmeric by making juice with it. Add the powder directly to the juicer and blend it with other ingredients. A little turmeric goes a long way; add just 1 teaspoon of turmeric to enjoy the full power of this herb, according to Elizabeth Lipski, author of "See How Easily You Can Naturally Reduce Arthritis, Pain and Inflammation." 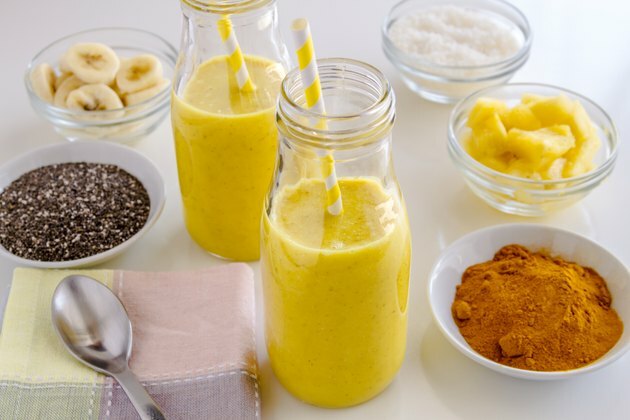 The turmeric blends well with both sweet and savory ingredients, so experiment with your favorite fruits and vegetables until you find the perfect flavor combination. Most practitioners of natural medicine consider turmeric to be safe, according to Deepak Chopra and David Simon, authors of "The Chopra Center Herbal Handbook." However, like most therapeutic herbs, turmeric is not appropriate for everyone. Turmeric is a natural blood thinner, so avoid taking it if you are on prescribed blood thinners. Turmeric might also upset your stomach if you are sensitive or if you are taking medication for ulcers or heartburn. Consult your physician before you use turmeric if you have any of these conditions. If you are interested in using turmeric for juicing, you can simply purchase the spice at your local supermarket. You will probably not find the whole herb in your local stores, and the powder will blend more smoothly in the juice anyway. Turmeric is also available as an extract or in pill form at many natural health food stores or vitamin stores. Make sure you read the ingredients and purchase only pure turmeric to avoid side effects from other ingredients. Complete Idiot's Guide to Arthritis; Amye Leong et al.